How to get there: Kefalonia is the largest Ionian island on the west coast of Greece. 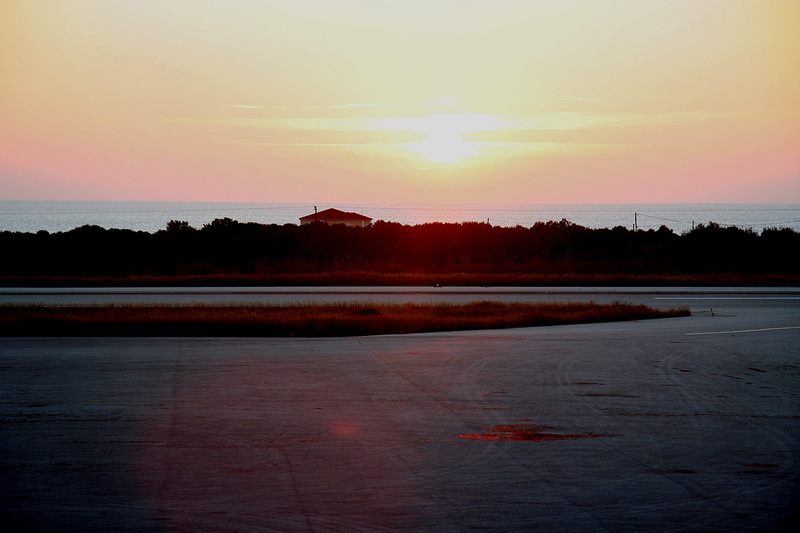 There is a daily flight from Athens to the local airport located just south of the largest city, Argostoli. From Argostoli, take a taxi (or drive if you rent a car) around the local bay, then east along the Hwy. that connects to the village of Sami on the east side of the island. 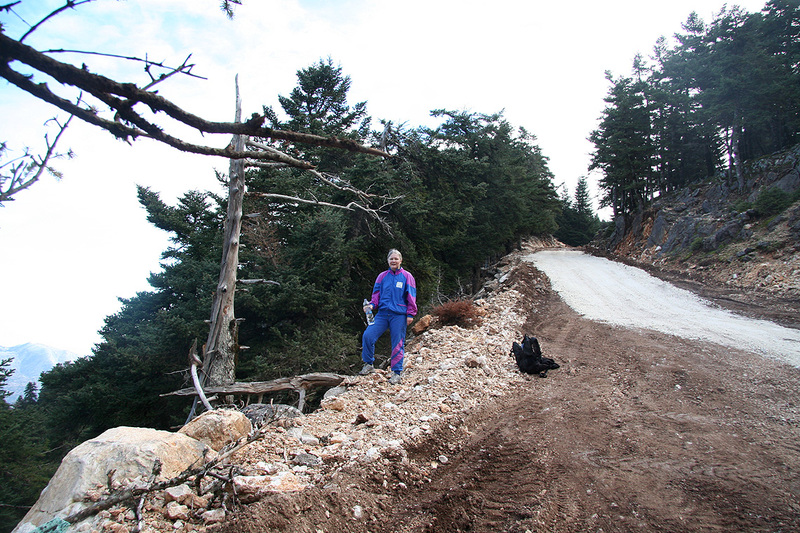 Follow this road for approximately 11.8 kilometer until it reaches the main crest of the mountain. Do not descend, but take a right (there may be a sign for Mount Enos) and continue along a paved road for about 6.7 kilometer. At this point, a fairly wide dirt road forks left while the paved road turns right. Stop here, this is the trailhead. There is a small sign saying that you cannot continue on the paved road, it serves some radar installations nearby. This trailhead is located at N38:10.059, E020:37.109, elevation 976 meter. We stayed in hotel Mirabel in Argostoli, it is one of the relatively few hotels that are open year round. The taxi from our hotel to the trailhead was 30 Euro (2006), a very convenient way to start the hike. Route description: The dirtroad that starts out at the trailhead can be followed all the way to the summit. One may actually drive all the way, but then you only "visit" the summit. 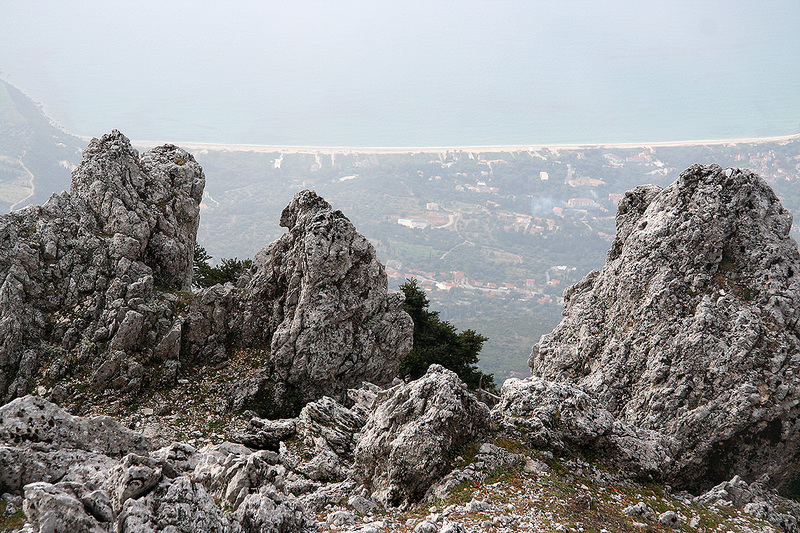 In order to qualify as a European Ultra climb, one must walk from the trailhead described above, or from the south side starting from the village of Arginia. Comments: Mount Enos is located in a small national park (established in 1962), due to the very special fir tree forest growing near its top. The dark green color of these trees earned Mount Enos its Venetian name Monte Nero, meaning black mountain. The black Kefalonia fir tree, Abies Cephallonica, is endemic to Mount Enos, and it is found nowhere else in such profusion and purity, unaffected by hybrids. I did this climb with my wife Heidi, very nice company to an easy, but nice European ultra prominent mountain. We started out at 0920 and walked at a good pace in order to reach the summit after 1.5 hours at 1050. 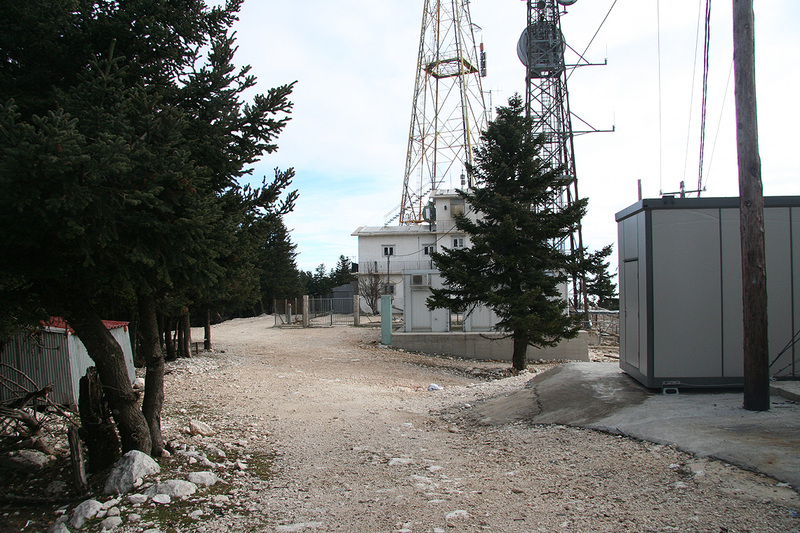 We had a short rest, took some pictures and generally looked around the various antennas. 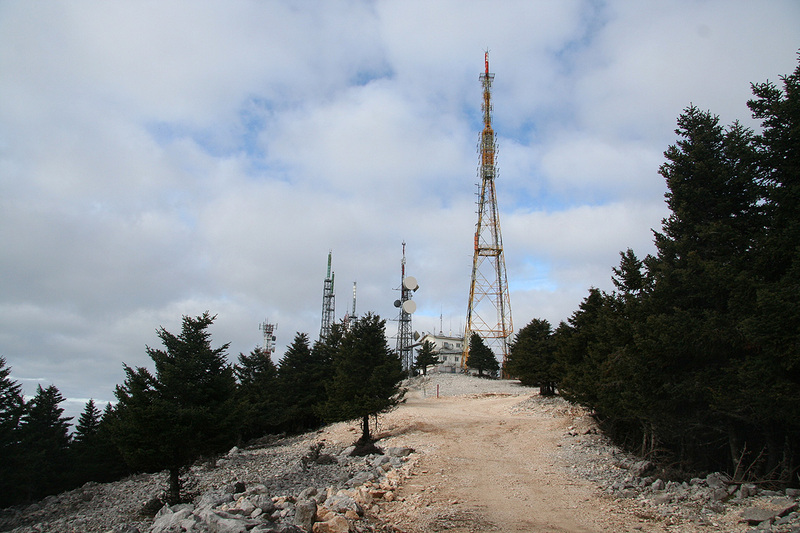 The summit area is a bit cluttered by too many antennas. However, as we proceeded in order to traverse the mountain, shortly after leaving the antennas behind, leave the road and climb the obvious rocky ridge on your right hand side. This route will get you onto a short and nice summit ridge that is almost as high as the antennas. The high point here is located at N38:08.189, E020:40.049, and measured 1619 meter. We were there at 1125. Heidi started to descend the short distance back down to the road while I took some pictures and waypoints. However, when I descended, she was nowhere to be seen and did not answer my shouting. Hmm, I assumed she had started down the road, but as I did not catch up with her, I started to wonder if she still somehow was back up near the ridge. Hard to say, I decided to hike down to the first road fork, under the assumption that she would definitely not hike any further than that before waiting. She was not there and after leaving a sign that I had headed back uphill, I set out going back. Fortunately, I met her after about 2 kilometer. It turned out that she must have started looking for me, making a loop back up to the ridge as I descended and we missed each other. An example of how easily one may get separated even in a somewhat trivial area. From Arginia, we continued on a paved road as it zig-zag'ed down to the village of Atsoupades. We arrived at the local gas station at 1540, a total of 6 hours and 20 minutes, a walk of about 26 kilometer. This gas station is located at N38:05.262, E020:42.298, elevation 190 meter. From here, we called a taxi in Argostoli. As it turned out, our driver was the son of the man that had taken us to the trailhead in the morning. The fare back was also 30 Euro and a very nice December hike had been concluded. We tried our "step counters" on this trip (courtesy Intel at Supercomputer 06), mine showed a total of about 37000 steps, while Heidi's showed close to 39000, fairly consistent with my stride being a bit longer than hers. 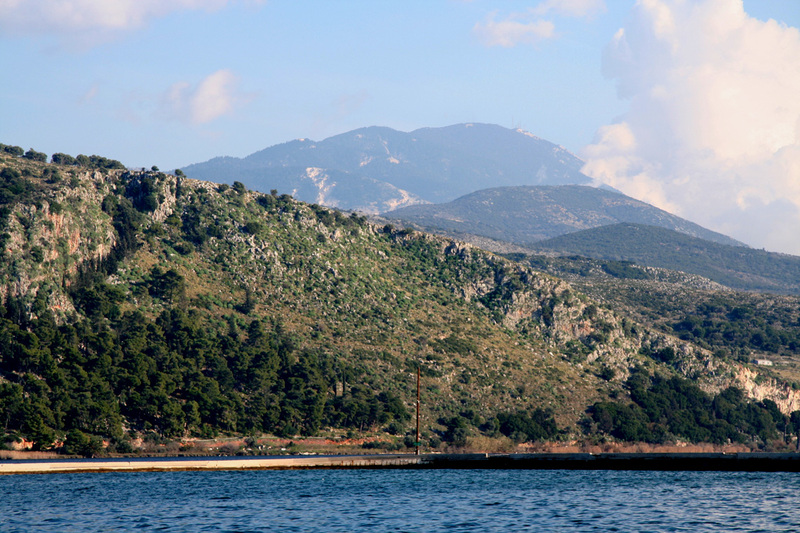 Mount Enos, as seen from Argostoli. 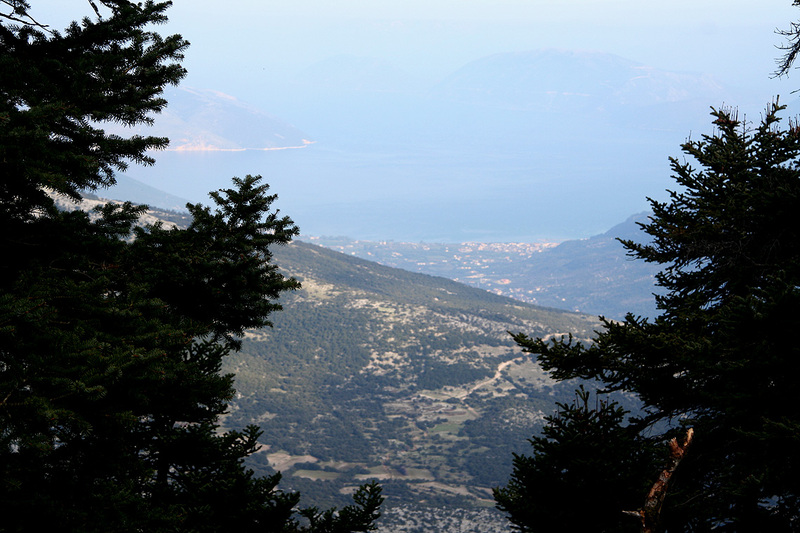 Mount Enos, summit area as seen from Argostoli. The antennas pinpoint the summit location. 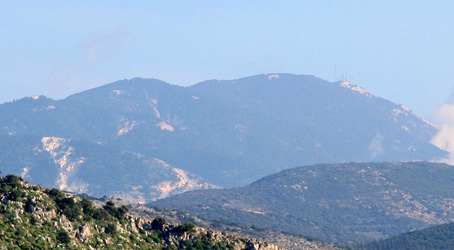 View north, while hiking towards the summit. 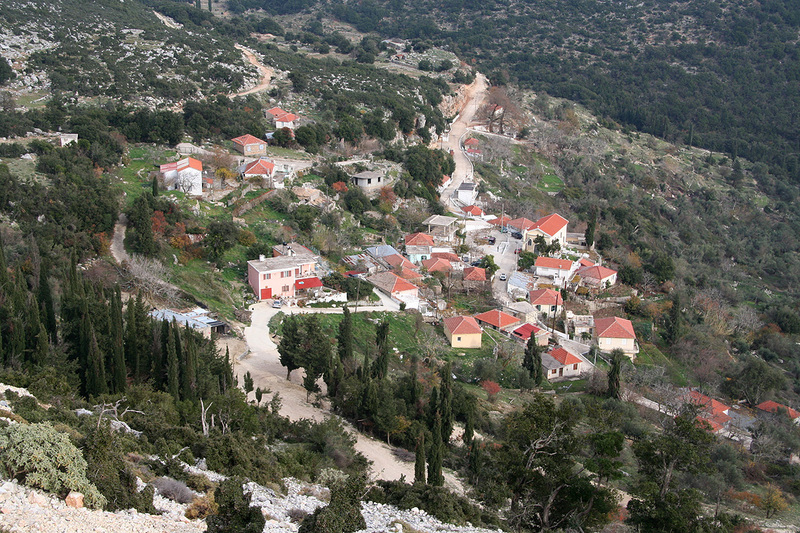 The village of Sami, while the island of Ithaca can be seen further out. Approaching the highest point. Too bad, that they could not leave this spot alone. Heidi on the summit. 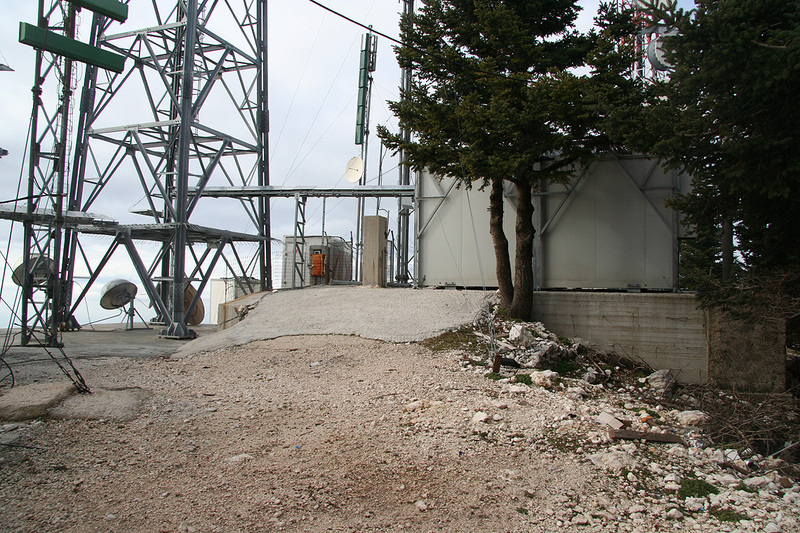 The summit is, unfortunately, covered by concrete. It may even have been slightly higher in the past. 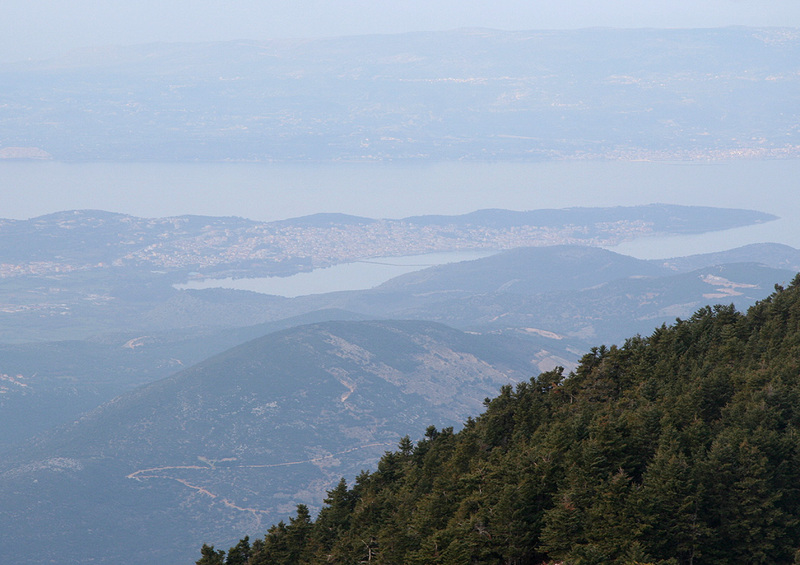 Summit view, Argostoli, with the second largest city, Lixouri, further behind. 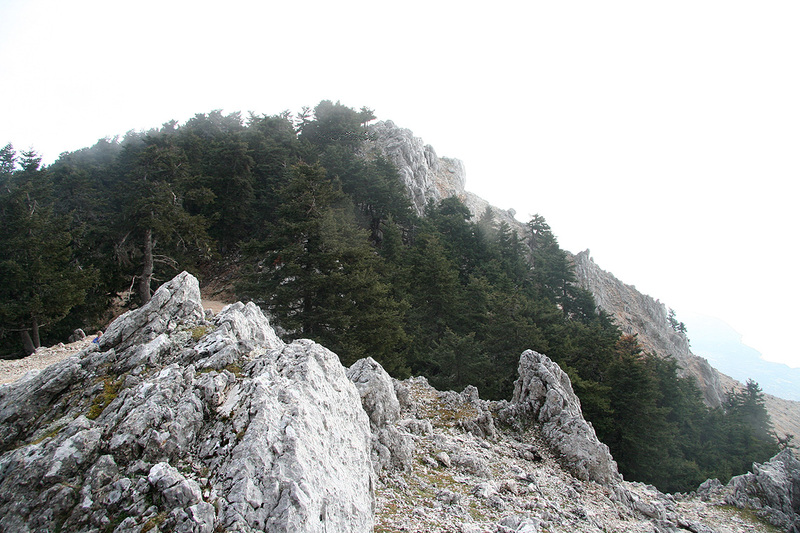 Approaching the second summit, only about 8 meter lower. 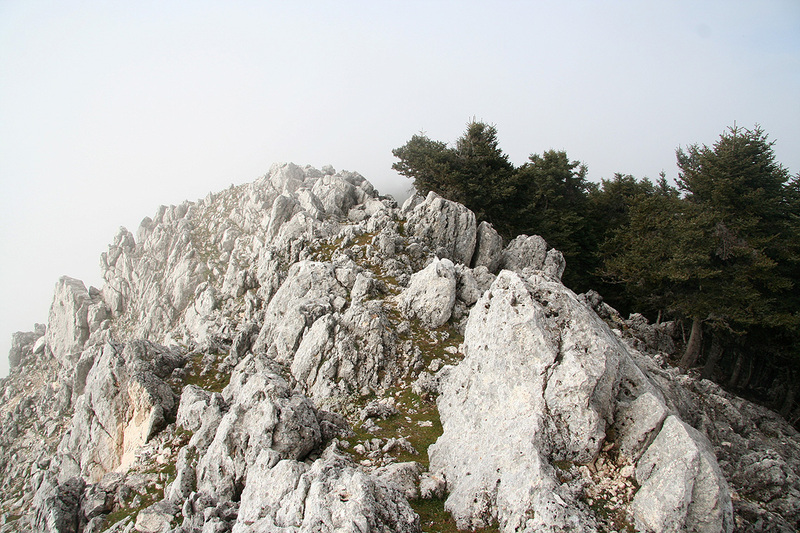 The small rock ridge east of the summit. This ridge is 1619 meter high and certainly nicer than the summit area. Beach view, only 1600 meter below. The village of Arginia, the first village when descending on the south-east side. Lixouri, the second largest city on Kefalonia.